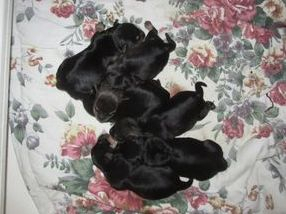 All our puppies are raised in our home, the image above, is of a litter of puppies at about 1 week old. 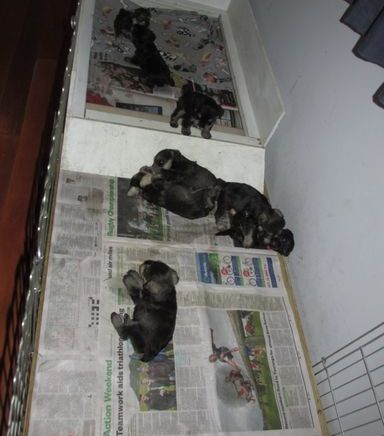 Puppies are now about 4 weeks they are out of the whelping box and playing and learning to toilet in the run on the newspaper. 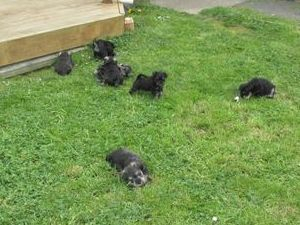 At 5 weeks puppies are introduced to the grass and learn to toilet on the grass. At 9 weeks puppies are ready to leave for their new homes,they have been well handled and loved, they will have had their first vaccinations, full vet check and be microchipped. Every puppy is sent home with their pedigree papers, 6 weeks free insurance, a sales agreement, first vaccination, microchipped, a full vet check and a lovely gift bag which contains 1kg of their food, a blanket the puppies have been sleeping on, a toy, worm tablets to last until they are 4 months old. 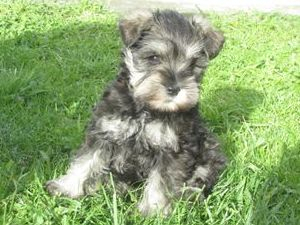 Our puppies are sold as pets only (Desexing contract applies) occasionally we may be able to offer a puppy on the full register but this would need to be discussed with us first. 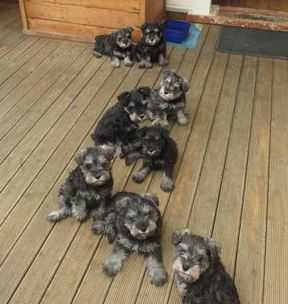 We also offer to rehome any puppy no matter what the age for their lifetime. If your circumstances change you can have confidence that your family member will be found a new home where they can be provided the time and love they need.